Kabul is a city clogged with an estimated 4 to 5 million people and traffic to match that human crush. 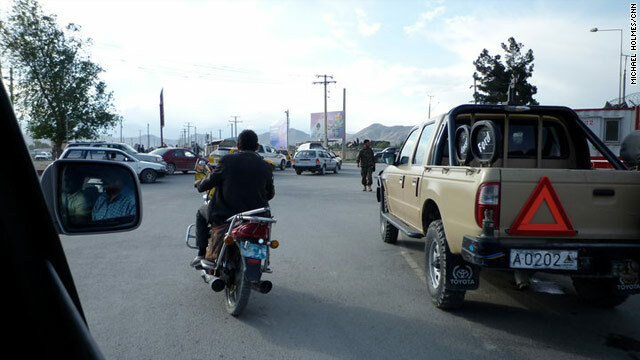 Traffic in Afghanistan's capital city is notoriously awful. CNN's Michael Holmes gives a first-person account (as a passenger, of course) of a commute to work through the Kabul streets. Most help articles on the web are inaccurate or inohcernet. Not this! Err...okay? So where is this video? CNN - don't continue to post the headline when you've pulled the video! Cheers! I have to agree with Steve on this one. My husband is there and a bunch of friends. I rely on CNN a lot for information. Question for the staff of CNN... why is the war in Afghanistan not of the "round the clock" news type on TV? I'm really glad that you guys have this "Afghanistan Crossroads" page (not a lot of other big media sites have this extensive coverage on the Internet)... but why are there no reports on the TV about what's going on? Seriously, we have troops dying, bases being attacked, Taliban being killed in various different operations... and by watching TV, you wouldn't even know that a war was going on. I find it offending that CNN, Fox News, MSNBC, BBC World, and all the other major networks spend maybe a minute or two every week reporting on the TV. This (not necessarily this article, but others) should be ROUND THE CLOCK reported on. what is this article really about? thats what happens when NATO goes to a poor country and provides people with jobs.......would you stay on your farm?